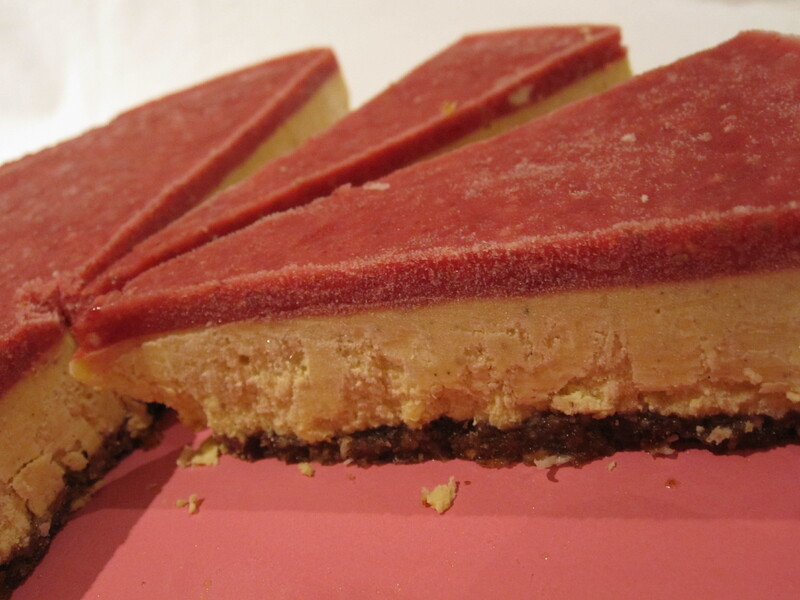 Time for another raw cheesecake recipe – something seasonal and tangy with lots of citrus to ward off colds and flu and build up the immune system. Process together all ingredients in a processor until a dough forms. I recommend grinding the pecans first then adding remaining ingredients. Sprinkle shredded coconut on the base of an 8 or 12 inch springform pan. Press dough into the base of the springform pan – using your clean fingers works best. Blend all ingredients, except oil and butter, together in a high speed blender until smooth and creamy. While the blender is on drizzle in the oil and butter and incorporate. Chill in the fridge or freezer until set. Blend all ingredients until well combined – make sure that the pomegranate seeds and well blended. Pour over pre-chilled filling and freeze for an hour. To serve, thaw for half an hour – cut and serve. This has a delicious citrus tangy and the pomegranate is well raspberry like.